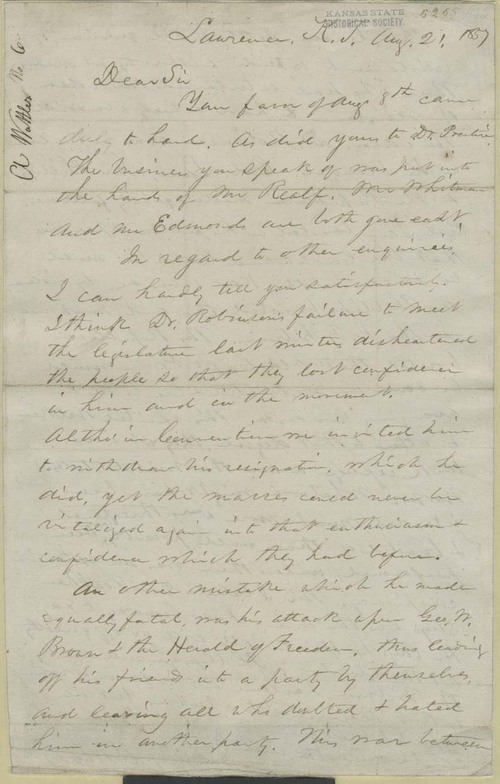 Augustus Wattles wrote to John Brown from Lawrence, August 21, 1857, regarding several matters but focused again on problems within the Free State movement because of a loss of confidence in Charles Robinson's leadership. Robinson had openly criticized G. W. Brown and the Herald of Freedom and the factious party could accomplish little, but Wattles was confident that free staters would vote in and win the October election for territorial legislature. Augustus Wattles to John Brown?